For the ancient Roman title, see Roman dictator. For other uses, see Dictator (disambiguation). Julius Caesar, dictator of Rome. Adolf Hitler (right), dictator of Germany from 1933 to 1945, and Benito Mussolini (left), dictator of Italy from 1922 to 1943. 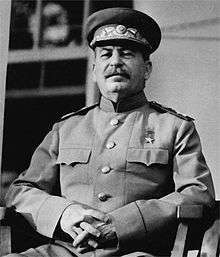 Joseph Stalin, dictator of the Soviet Union from 1929 to 1953. Augusto Pinochet, dictator of Chile from 1973 to 1990. A dictator is a ruler who wields absolute power. A state ruled by a dictator is called a dictatorship. The word originated as the title of a magistrate in the Roman Republic appointed by the Senate to rule the republic in times of emergency (see Roman dictator and justitium). Like the term "tyrant" (which was originally a respectable Ancient Greek title), and to a lesser degree "autocrat", "dictator" came to be used almost exclusively as a non-titular term for oppressive, even abusive rule, yet had rare modern titular use. The term "dictator" is comparable to – but not synonymous with – the ancient concept of a tyrant; initially "tyrant", like "dictator", did not carry negative connotations. A wide variety of leaders coming to power in a number of different kinds of regimes, such as military juntas, one-party states and civilian governments under personal rule, have been described as dictators. They may hold left or right-wing views, or may be apolitical. Originally an emergency legal appointment in the Roman Republic, the term "Dictator" did not have the negative meaning it has now. A Dictator was a magistrate given sole power for a limited duration. At the end of the term, the Dictator's power returned to normal Consular rule whereupon a dictator provided accountability, though not all dictators accepted a return to power sharing. The term started to get its modern negative meaning with Cornelius Sulla's ascension to the dictatorship following Sulla's second civil war, making himself the first Dictator in more than a century (during which the office was ostensibly abolished) as well as de facto eliminating the time limit and need of senatorial acclamation, although he avoided a major constitutional crisis by resigning the office after about one year, dying a few years later. 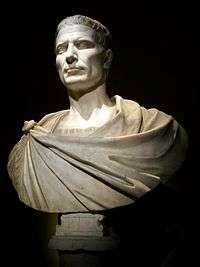 Julius Caesar followed Sulla's example in 49 BC and in February 44 BC was proclaimed Dictator perpetuo, "Dictator in perpetuity", officially doing away with any limitations on his power, which he kept until his assassination the following month. Democracy Index by the UK based magazine The Economist, 2015. 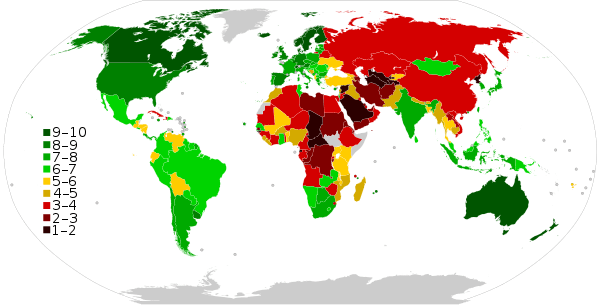 Countries marked in different shades of red of are considered undemocratic, with many being dictatorships. Most current dictatorships are in Africa and Asia. 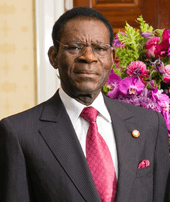 Teodoro Obiang Nguema Mbasogo of Equatorial Guinea is Africa's longest serving dictator. As late as the second half of the 19th Century, the term "Dictator" had occasional positive implications. For example, when creating a provisional executive in Sicily during the Expedition of the Thousand in 1860, Giuseppe Garibaldi officially assumed the title of "Dictator" (see Dictatorship of Garibaldi). Shortly afterwards, during the 1863 January Uprising in Poland, "Dictator" was also the official title of four leaders, the first being Ludwik Mierosławski. Past that time, however, "Dictator" assumed an invariably negative connotation. In popular usage, "dictatorship" is often associated with brutality and oppression. As a result, it is often also used as a term of abuse for political opponents. The term has also come to be associated with megalomania. Many dictators create a cult of personality and have come to favor increasingly grandiloquent titles and honours for themselves. For instance, Idi Amin Dada, who had been a British army lieutenant prior to Uganda's independence from Britain in October 1962, subsequently styled himself as "His Excellency, President for Life, Field Marshal Al Hadji Doctor[A] Idi Amin Dada, VC,[B] DSO, MC, Conqueror of the British Empire in Africa in General and Uganda in Particular". In the movie The Great Dictator (1940), Charlie Chaplin satirized not only Adolf Hitler but the institution of dictatorship itself. The association between the dictator and the military is a common one; many dictators take great pains to emphasize their connections with the military and often wear military uniforms. In some cases, this is perfectly legitimate; Francisco Franco was a lieutenant general in the Spanish Army before he became Chief of State of Spain; Manuel Noriega was officially commander of the Panamanian Defense Forces. In other cases, the association is mere pretense. In the former city-state Venice, and while it was a republic resisting annexation by either the kingdom of Piedmont-Sardinia or the Austrian empire, a former Chief Executive (president, 23 March 1848 – 5 July 1848), Daniele Manin (b. 1804 – d. 1857), was styled Dictator 11–13 August 1848 before joining the 13 August 1848 – 7 March 1849 Triumvirate. The Dictatorial Government of Sicily (27 May – 4 November 1860) was a provisional executive government appointed by Giuseppe Garibaldi to rule Sicily. The government ended when Sicily's annexation into the Kingdom of Italy was ratified by plebiscite. Emilio Aguinaldo, the last President of the Supreme Government Council 23 March 1897 – 16 December 1897 and chairman of the Revolutionary Government from 23 June to 1 November 1897, was president of the "Dictatorial Council" from 12 June 1898 – 23 January 1899. Jan Tyssowski was Dictator from 24 February 1846 – 2 March 1846. Prince N. Tarkovsky was Dictator of the Mountainous Republic of the Northern Caucasus. Sudanese President Omar al-Bashir is wanted by the ICC for war crimes and crimes against humanity. Under the Soviet leader Joseph Stalin, notorious "Gulags" were formed. Most Gulag inmates were not political prisoners, although significant numbers of political prisoners could be found in the camps at any one time. Data collected from Soviet archives gives the death toll from Gulags at 1,053,829. Pol Pot became leader of Cambodia in 1975. In all, an estimated 1.7 million people (out of a population of 7 million) died due to the policies of his four-year dictatorship. As a result, Pol Pot is sometimes described as "the Hitler of Cambodia" and "a genocidal tyrant". The International Criminal Court issued an arrest warrant for Sudan's military dictator Omar al-Bashir over alleged war crimes in Darfur. In social choice theory, the notion of a dictator is formally defined as a person who can achieve any feasible social outcome he/she wishes. The formal definition yields an interesting distinction between two different types of dictators. The strong dictator has, for any social goal he/she has in mind (e.g. raise taxes, having someone killed, etc. ), a definite way of achieving that goal. This can be seen as having explicit absolute power, like Sulla. The weak dictator has, for any social goal he/she has in mind, and for any political scenario, a course of action that would bring about the desired goal. For the weak dictator, it is usually not enough to "give their orders", rather he/she has to manipulate the political scene appropriately. This means that the weak dictator might actually be lurking in the shadows, working within a political setup that seems to be non-dictatorial. An example of such a figure is Lorenzo the Magnificent, who controlled Renaissance Florence. Note that these definitions disregard some alleged dictators who are not interested in the actual achieving of social goals, as much as in propaganda and controlling public opinion. Monarchs and military dictators are also excluded from these definitions, because their rule relies on the consent of other political powers (the barons or the army). A ^ He conferred a doctorate of law on himself from Makerere University. B ^ The Victorious Cross (VC) was a medal made to emulate the British Victoria Cross. ↑ "dictator – Definition from the Merriam-Webster Online Dictionary". www.merriam-webster.com. Retrieved 2008-08-01. ↑ Papaioannou, Kostadis; vanZanden, Jan Luiten (2015). "The Dictator Effect: How long years in office affect economic development". Journal of Institutional Economics. 11 (1). doi:10.1017/S1744137414000356. ↑ Olson, Mancur (1993). "Dictatorship, Democracy, and Development". American Political Science Review. 87 (3). ↑ "The Five Worst Leaders In Africa". Forbes. February 9, 2012. ↑ Keatley, Patrick (18 August 2003). "Obituary: Idi Amin". The Guardian. London. Retrieved 2008-03-18. ↑ "Daniele Manin Facts". Biography. Retrieved 6 January 2016. ↑ "Notes of a Red Guard". ↑ "The world's enduring dictators". CBS News. May 16, 2011. ↑ "Gulag Prisoner Population Statistics from 1934 to 1953." Wasatch.edu. Wasatch, n.d. Web. 16 July 2016: "According to a 1993 study of archival Soviet data, a total of 1,053,829 people died in the Gulag from 1934 to 1953. However, taking into account that it was common practice to release prisoners who were either suffering from incurable diseases or on the point of death, the actual Gulag death toll was somewhat higher, amounting to 1,258,537 in 1934-53, or 1.6 million deaths during the whole period from 1929 to 1953.."
↑ "Top 15 Toppled Dictators". Time. October 20, 2011. 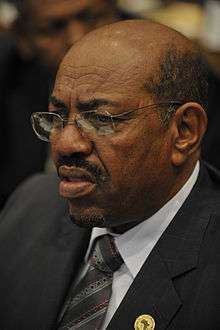 ↑ "Sudanese dictator Omar al-Bashir faces war crimes charges". The Daily Telegraph. July 14, 2008. ↑ "Idi Amin: a byword for brutality". News24. 2003-07-21. Retrieved 2007-12-02. Bunce & Wolchik, Valerie, Sharon L. (2012). Socialism Vanquished, Socialism Challenged: Eastern Europe and China, 1989-2009. Oxford University Press. Retrieved 5 March 2013. Issac, Jeffrey C. (2000). Between Past and Future: The Revolutions of 1989 and Their Aftermath. Central European University Press. Retrieved 5 March 2013. Pavlowitch, Stevan K. (2002). Serbia: The History of an Idea. New York, NY: New York University Press. p. 128. ISBN 0-8147-6708-7.